There are a selection of gas central heating boilers available; they all carry out the same functions in their individual ways. The availability of different boilers gives you the choice and flexibility to have the boiler fitted in practically any room in the house. 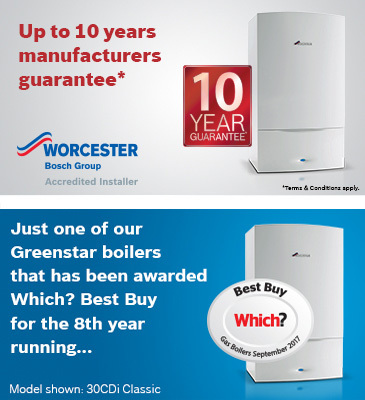 The most popular boiler is the combination boiler, it's a mains pressure boiler, which eliminates the need for a hot water storage cylinder and roof tanks and delivers continuous hot water on demand. The following is a short description of the main types of boilers available but by no means a complete list. These boilers are up to 30% more efficient in operation than standard boilers, the reason being is they incorporate a secondary heat exchanger; this extra heat exchanger utilizes the usually wasted hot flue gases, which are normally expelled through the flue. This in turn help the boiler to create more useful heat making it over 90% efficient in operation. They also produce less carbon dioxide gas which in turn helps the environment ie:- the 'Greenhouse Effect' This process reduces the flue gas temperature to the point where it condenses, therefore requiring a 22mm condense pipe from the boiler to discharge into a convenient house drain or waste pipe. 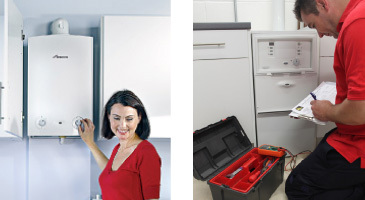 There is also a Combination Condensing boiler available that incorporates attributes of both boilers. They have the facility of extending the 4" diameter flue 3 metres horizontally or vertically enabling the boiler to be sited on internal as well as exterior walls. The unique design of these boilers enable them to be connected to the mains water supply and incorporate an integral instantaneous water heater which eliminates the need for a hot water storage cylinder and roof storage tanks. The hot water supply will run continually on demand; it operates on the same principle as a gas multipoint water heater. These boilers, being fan-flue, can be sited almost anywhere in the house including airing cupboards in place of the hot water cylinder. Like the Combination boiler the heating is under mains water pressure, which eliminates the need for a heating header tank in the roof space. Unlike the combination boiler the system boiler still requires a hot water storage cylinder and a main cold storage tank in roof space, so the hot water is under tank, not mains water pressure. Ideal with a boiler change if you want to retain your hot water cylinder. This boiler also being fan-flue like the combination boiler can be sited almost anywhere. This boiler does not work under mains water pressure like the system or combination boilers it is a low water tank pressure boiler. It retains the hot water cylinder and both cold water and heating header tanks in roof space. Ideal where a conventional system need to be retained, this boiler can also be sited almost anywhere. Floor standing boilers are made in fanned flue version only, this version can have extended flues to the outside so it does not need to be fitted directly to an outside wall and be used with fully pumped systems.